Realizing I needed a completely different skincare regimen, I started searching for what a face like mine could need. Watching the "skincare" videos of my favourite youtubers, asking in some Facebook groups, asking friends. My skin type is acne-prone (hormonal breakouts around my jawline and mouth area), combination (dry patch on my chin, gets oily in the t-zone), uneven skintone (redness, some texture) and sensitive skin. It felt a bit overwhelming to try to properly address all of these concerns!! I saw the ProActiv commercial with the free brush and was very tempted but then from a bit of research I concluded that it was likely too harsh for my skin, and not a skincare routine to follow long term. A helpful commentor to my question on Facebook gave me some good suggestions and info, and I decided from there to start using an acne spot treatment and an acne-fighting toner. A Mary Kay lady contacted me and I decided to buy the acne spot treatment from her, something to use a couple times a day on actual breakouts. 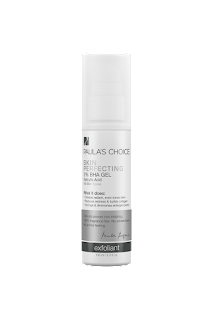 It's the Clearproof acne treatment gel 5% benzoyl peroxide and I like the texture and smell and I feel it made a difference in how fast the breakouts faded from using this product. For toner I started alternating between a very soft and mild toner, not for acne (Simple Soothing Facial toner) and something in the acne-fighting category (Biore blemish fighting astringent) and I feel comfortable with this combination. Since late September (full 2 months of use), I've been using the Skin Perfecting 2% BHA gel exfoliant and it has done wonders! I really do feel my skin being way less acne-prone, softer, and smoother. Pores seem slightly reduced, texture slightly improved. The product has a gooey texture, goes on watery and a little goes a long way. It can be applied once or twice a day. I mostly apply it at night but the feel of the product is not unpleasant for using in the daytime as well. The second product I purchased is a daytime moisturizer with SPF. 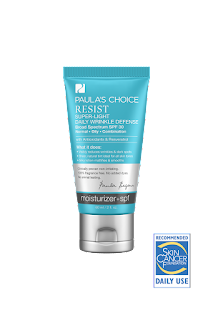 I got the Resist Super-Light Wrinkle Defense SPF 30. It is definitely light, sinking into the skin quickly and giving a smooth finish. It's ideal for oily skin and will not be enough for dry skin. The cream is tinted in a a way that evens out skintone even if it's not something I'd consider makeup. Since I started using both products, I've been feeling more confident with my skin's appearance and my makeupless face. I plan on re-purchasing both of these when I'm out, and adding a nighttime moisturizer and serum by Paula's Choice to my routine. Seriously, my limited experience with their products has left me impressed. And a note about the Customer service, it's incredible! They helped me pick what was best for me when I called in originally, and when there was a mistake with a product I purchased being back-ordered, they refunded me, and compensated me for the problem in a super-quick delay.